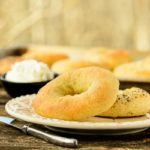 Homemade cornmeal bagels are slightly sweet and have the classic chewy texture with a hint of cornbread. It's a southern twist to bagels you will enjoy. Whisk together 1 cup bread flour, cornmeal, yeast, 2 tablespoons sugar, and salt in the bowl of a stand mixer. Heat water to warm (120° to 130°F) and add it and the oil to flour mixture. Stir to combine. Add egg and stir to combine. Blend on medium speed using the flat beater for 3 minutes. Switch flat beater to dough hook and turn mixer to the manufacturer's recommended speed when using a dough hook. Whisk together remaining flours and gradually add enough to make a soft dough and the dough "cleans" the sides of the bowl. Knead with dough hook for 4 minutes. Hand knead dough a few times until smooth. Place in a greased bowl, turning to grease top. Cover and let rise in a warm place until doubled, about 1 hour. Heat oven to 375°F. Line rimmed baking sheets with parchment paper. Bring a large pot of water 3-inches deep to a low boil (or fast simmer) and add 1 tablespoon of sugar for every quart of water. Punch down dough and divide it into 12 equal pieces. Shape each piece into a smooth ball. Use a finger to punch a hole in the center. Gently pull dough to make a 1- to 2-inch hole. Place a few bagels at a time in the boiling water (bottom side up works best). Turn bagels over after 45 seconds. Boil for another 45 seconds then remove bagels from water using a slotted spoon and place them on a wire rack to drain for a few minutes. Place drained bagels on baking sheets. If you want to top the bagels with seeds, brush tops with beaten egg white and sprinkle the seeds on top. Bake bagels until golden brown, about 20 to 25 minutes. Rotate sheets half way through baking for even browning. Transfer bagels to a wire rack to cool completely.